Although the reactive power required by inductive loads is not used in profitable work, it has to be generated, transported and distributed through the electrical network. This forces users and utilities to oversize transformers, generators and lines, as well as provokes the existence losses and line voltage drops. For this reason, many electrical utilities penalize reactive power consumption with substantial additional charges. 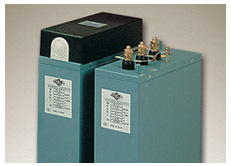 Electrical capacitors installed near the inductive loads produce the reactive power required by these inductive loads, helping end users minimize reactive power penalties. Implementing a reactive power management solution is one of the most cost effective things a commercial power consumer can invest in, and offers a very high ROI. Barb Electrical manufacturers and distributes a range of solutions and also offers survey and other technical services. Call us today to learn how we can help you get your power under control. The ratio between real power and apparent power in a circuit is called the power factor. It’s a practical measure of the efficiency of a power distribution system. For two systems transmitting the same amount of real power, the system with the lower power factor will have higher circulating currents due to energy that returns to the source from energy storage in the load. These higher currents produce higher losses and reduce overall transmission efficiency. A lower power factor circuit will have a higher apparent power and higher losses for the same amount of real power. This type of compensation is applied to motors, transformers, and in general to loads with a long operating time. Capacitors are connected directly in parallel to the terminals of the loads. When there is a large and spread number of inductive loads in the installation, the individual compensation can become uneconomical. In these cases the centralized compensation by means of an automatic capacitor bank with automatic regulation offers the most simple and economical solution. Total power is subdivided in a number of capacitor steps that can be connected independently. A reactive power controller measures continuously the needs of the installation and connects or disconnects the capacitors to reach a prefixed cos φ.
Specialised equipment may be needed when dealing with Harmonic distortion, and Barb Electrical are experts in this field. If you know, or think this may be an issue for you, you should talk to us and arrange an energy survey before planning your Reactive Power Compensation solution. Harmonics is a specialised field where experience is everything. As a manufacturer and supplier that commissions its products on site, we have seen at first hand the energy profiles of many of Ireland’s commercial energy users and have acquired countless hours of experience with harmonics in major installations throughout Ireland. Harmonic problems can not be solved by a book. Call us today. Harmonic distortion levels in electrical distribution systems have been increasing in recent years because of the large development and use of power electronics; so much so that harmonic distortion has become a common problem in plants and facilities. It is often caused by static power conversion equipment, such as variable speed drives for motors, soft starters, rectifiers and UPS systems. Harmonic distortion can cause cables and transformers to overheat, circuit breakers to trip and computers and communication equipment to malfunction. In operation, most of the static converters need reactive power that has to be compensated by capacitors. When the wrong reactive power compensation solution is installed and used with converters generating harmonics, resonance conditions can cause high harmonic voltages and currents that can damage or destroy the wrong capacitors and your electrical installation. • Disturbances in electronic & data processing systems. • Erratic operation of control and protection relays. 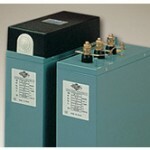 • Failures in transformers &motors due to overheating. • Overheating of protective fuses causing them to blow. Can you afford your plant to go down, while you run around looking for replacement switch gear and expensive custom ordered equipment to be sourced? If not then you need to talk to people who have in-depth experience with the evolving Harmonics problem.